What sort of Shaped Chains do we find? 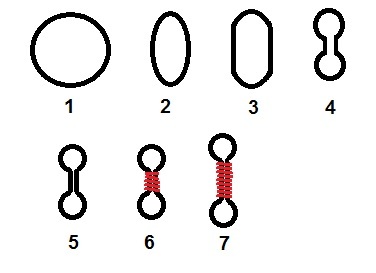 If you remember, last time I divided shaped chains into chains that started out round, and chains that may not have started out round. The reason that I say “may not” is because we have no way of knowing, based on the final shapes of these chains if they started out as round links, or some other shape. Round links are definitely one of the easiest shapes to wrap, but modern link making equipment also uses square, oval and triangular mandrels to wrap loops. I have recently begun experimenting with unusually shaped mandrels. It definitely takes a little getting used to, but it has potential. Unless we found a mandrel, in use, that was just left there with unfinished links (and a few cut ones and a partial chain just to help us know what was going on) we have no positive proof of exactly how a link was made, all we have is the final result. I should also mention that I am only currently discussing chains that are made from wire, not chains made from cast links. The chain on this gold enameled pendant from Germany is an excellent example of how cast links can be used, and just how elaborate some of them can be. And a La Tené chain with cast loops shows that simple can still be impressive. Anyway, probably the simplest change from round is oval. This 9th to 8th century BC bronze chain from Iran is a classic example. The picture is good because you can actually see where most of the links open. And once you have squished a link into a figure eight, you can make the squished part of the link longer and wrap the center of the figure eight with a wire spiral. I have actually seen two different forms of this type of link, one where a separate spiral of wire is wrapped onto the link and another where the wrap is actually created from the same wire as the link. The first entry on this Pinterest page is a copy of a page from the original publication on the finds at Birka, Sweden. The page shows just a few of the different types of chains that were found there. Number 13 shows one of the chains where the wrap is actually the same wire that the link is made from. This graphic shows the sort of natural progression that we can create in link formation. The links can be made as long as we want to, limited only by the limitations of the type of metal and the size of the wires that we use. Picture number 11 in the Birka chains is an excellent example of a long exaggerated link. Next time: Link shapes that may make your brain hurt. This entry was posted in Jewelry, Metal Working and tagged ancient chains, chains, figure eight chains, Greek chains, medieval chains, oval chains, Roman chains, round chains, Viking chains by Eirny. Bookmark the permalink.